14K charms with or without precious stones, sterling silver and collector pins featuring your favorite musical instrument or a meaningful musical theme: Clicking on a linked image will direct you to our popular music-inspired categories With music-themed jewelry from TheMusicHouse.com, you or your favorite singer, musician or instructor can enjoy music from anywhere all day long. 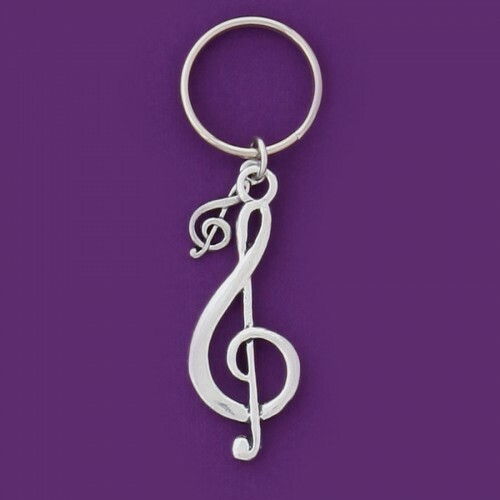 We offer a large selection of beautiful, unique charms, necklaces and earrings to suit any music lover’s style and budget. Our elegant, music-inspired jewelry is the perfect accessory for an evening concert, formal occasion or casual get-together. 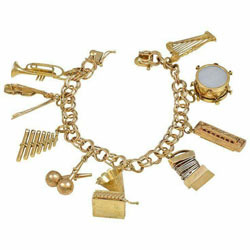 At TheMusicHouse.com, we have music jewelry for any style, aesthetic and interest. All our jewelry pieces and musical accessories are perfect for showcasing a beautiful personal style or given as a thoughtful gift for any musician or music lover. Pins and Brooches: With our collection of musical pins and brooches, you can enjoy your favorite sounds throughout the day. We have a wide selection of musical instruments and symbols to suit any taste and preference — choose from classic woodwinds like flutes and clarinets, edgy drum sets, banjos or acoustic and electric guitars, bass and treble clefs, graceful violins and harps or vibrant saxophones and French horns or trumpets. Be bold with our 24K gold pins with brushed color, or choose a more elegant appearance with brooches available in sterling silver with amber accents. Charms and Pendants: Our delicate charms and pendants are the perfect addition for any necklace or bracelet. Choose from intricate and dainty designs like guitars, banjos, pianos, horns and trumpets, saxophones, flutes, violins or musical notes and clefs. 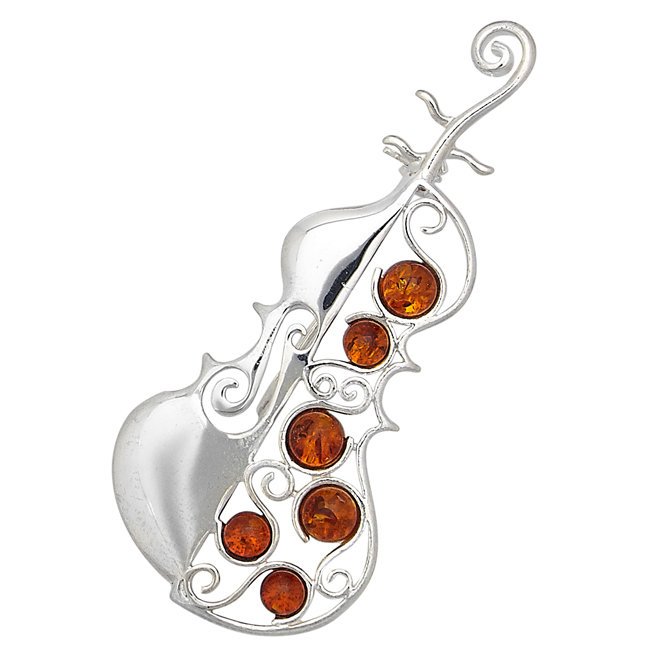 Many of our musical charms are crafted from quality silver or 14K gold, and for added ornamentation and sophistication several of our pendants feature precious stones such as diamond, ruby, sapphire, emerald and pearl. Earrings: The perfect and striking musical accessory for any occasion, our music-themed earrings are available in several designs including treble clefs, eighth notes, double eighth notes and pianos. We also offer several finishes to suit any style or preference, including gold and silver or sterling silver with a touch of amber. Necklaces: Let your heart sing out with an elegant musical necklace. 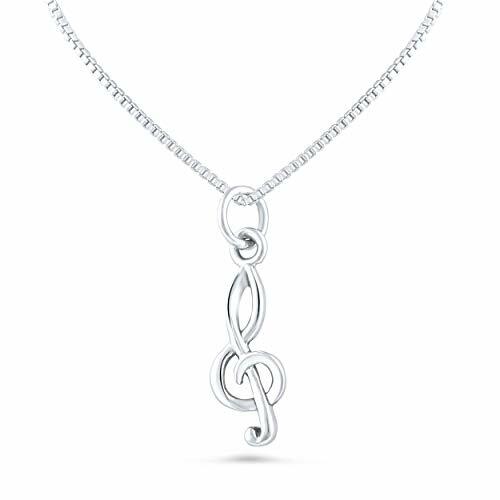 You can string several of your favorite musical charms and pendants onto a silver or gold chain for a simple statement or customize it to suit your singing niece or daughter’s interests. We have several fine jewelry options in 14K gold featuring glimmering jewels and precious stones like diamond, emerald and ruby that is sure to attract positive attention wherever you go. Watches: From wrist to pocket watches, you will never lose track of time with our music inspired collection of watches. Our stunning and delightful Charles Reuge pocketwatches have intricately designed scenes sculpted into their gold-plated surfaces and sing out pleasant tunes. 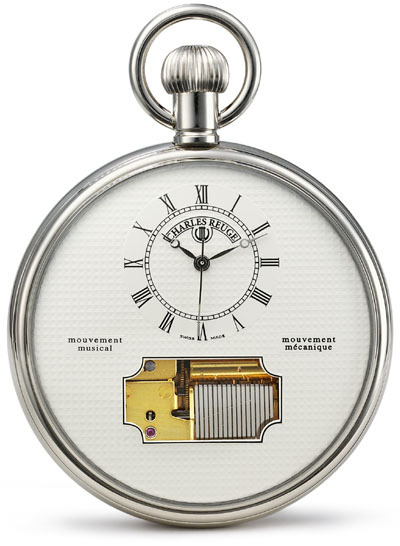 We also have quality pocket watches from Boegli with songs from Mozart, as well as more casual and whimsical wristwatches plated in gold with quality leather straps. 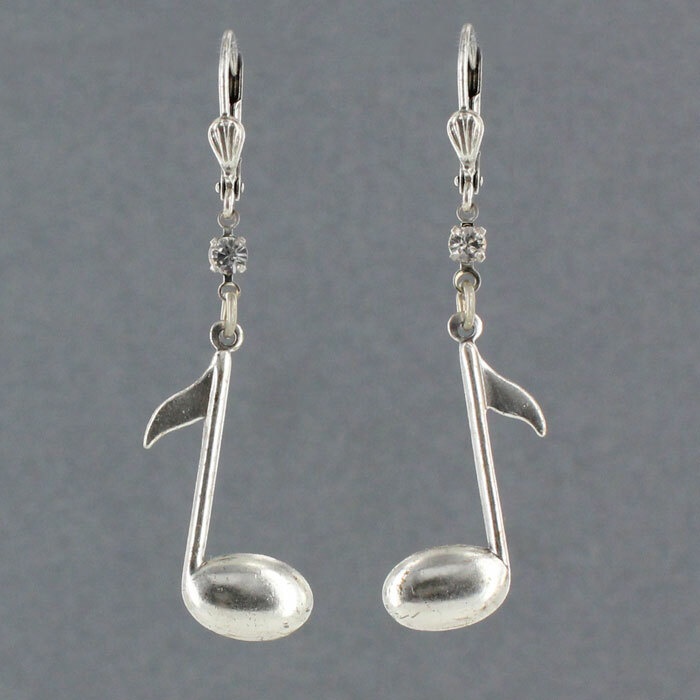 We should be able to enjoy music everywhere, and that’s why we at TheMusicHouse.com offer a wide selection of music-themed jewelry for every music lover in your life. For more than 45 years, we’ve only provided the most attractive, quality musical jewelry and other music inspired items and accessories. 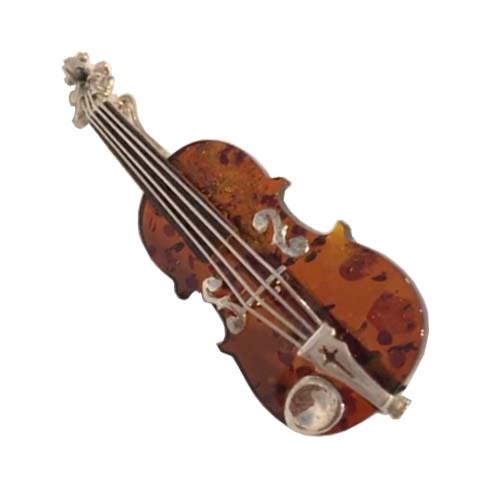 If you require assistance selecting musical jewelry for the special musician in your life, contact the helpful professionals at TheMusicHouse.com toll-free at 888-884-2533 or via email— we’ll be happy to help or answer any questions.